Holding a clipboard in one hand, pen in the other, Kathy O’Hara carefully spreads a lemon-sized blob of yellow latex between her free fingers. Shrunken, melted-looking, the balloon is barely recognizable except for the blue plastic ribbon still attached to it and the black writing across its face. ¶ “This one says, ‘The future is bright.’’’ She shakes her head at the irony, shoves it into her swelling-to-burst bag of balloon trash, and starts making notes on the clipboard’s survey sheet. Over her shoulder, just offshore, a pod of dolphins moves through the blue-green water, their backs glistening in the blazing midday sunlight—as if anyone here, on this sky-swept beach at the mouth of the Chesapeake Bay, needed a reminder of their purpose. ¶ “The last three times I’ve been out on the boat, I’ve found balloons,” says O’Hara, of Virginia Beach. Later, she’ll pull three foil balloons out of the back of her car to show me what she had found just the day before on a day trip out of Cape Charles where she and her husband, Tom, keep O’Cay, their Grand Banks 36.
s one of the leaders of today’s survey on Fisherman Island National Wildlife Refuge, just off the tip of the Delmarva peninsula at the Bay’s mouth, O’Hara is among a small and devoted team of volunteers, researchers, and others who have been fighting a steady battle to systematically document and quantify balloon trash in Virginia’s waters and on its beaches. Using this data, they hope to educate people about how balloons and their plastic bits are one of the most prevalent forms of marine debris posing a threat to marine and terrestrial wildlife. They also hope the data will inspire action to change or even regulate common practices such as mass balloon releases at sports events, and smaller balloon releases to memorialize a loved one or commemorate a special occasion like a wedding. Anyone who’s spent any time on the Chesapeake, the ocean, or their beaches has run across balloon litter. Foil balloons—those popular, shiny balloons that can be made into all kinds of appealing shapes—are heat-sealed plastic sheets covered with shiny metallic material. If accidentally or intentionally released, like any other plastic they stay in the environment forever in one form or another. Latex balloons, made of sap from the rubber tree, ultimately degrade, though how long that takes—months or years—is not clear. And all of the plastic bits attached to either type—string, filler-tubes, discs and clips for balloon bouquets or weights, and all manner of items people add, from plastic shot glasses to laminated notes, contribute to the massive plastics problem that’s threatening our waters. In a 2015 report published in Marine Policy by the Commonwealth Scientific and Industrial Research Organization and Ocean Conservancy scientists, balloons trailed only fishing gear and plastic bags and utensils as the deadliest marine debris for animals including sea turtles, seabirds, and mammals such as dolphins and whales. In 2011, the ICC released its report documenting 25 years of collecting trash during its annual worldwide cleanup (preventballoonlitter.org/publications). Although cigarette butts topped the list at nearly 53 million collected over that time, the report noted 1.25 million balloons collected, as well as 166 documented animals entangled in ribbon. In 2010 alone, the ICC worldwide cleanup gathered 75,168 balloons, and in 2011, nearly 94,000 balloons in one day. Virginia has already taken steps to address the issue. In 1990, the state became the first in the country to ban mass balloon releases, which the law defines as any number over 50 within a one-hour period. California, Connecticut, Tennessee, and Florida have also banned mass balloon releases, as have several cities, including Baltimore and Ocean City, Maryland. Still, balloon trash keeps ending up in the Bay and on the beaches, and today’s survey on Fisherman Island is one more small step in a long, determined journey. 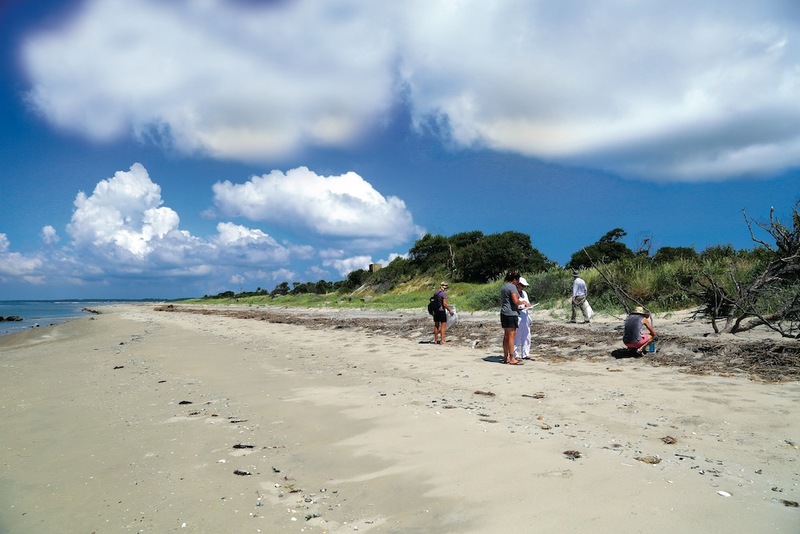 In August 2018, Trapani, O’Hara, and Katie Register, CVW’s executive director, in a first-of-its-kind effort to provide actionable data about the issue, released a report to the Virginia Coastal Zone Management Program detailing the results of five years of research on balloon marine debris on five remote Virginia Islands—Cedar, Hog, and Smith islands on the Atlantic coast, Fisherman just inside the Bay, and False Cape State Park in Virginia Beach. and 1,438 unattached plastic ribbons. They also found 36 weather balloons, especially complicated since they often include long parachutes, strings, wires, and Styrofoam instrument boxes. Foil balloons ran the gamut—505 stars, 159 hearts, 25 butterflies, 17 cupcakes, 5 dolphins, and 3 footballs. Popular characters were smiley faces (32), Spiderman (25), Mickey Mouse (23), Elmo (8), and Sponge Bob (7). By far, happy birthday won for the most messaged balloons with 364—with graduation in second place with 77, Mother’s Day with 49, Valentine’s Day with 25, and 1 Smile, Jesus Loves You. During each survey, they also picked up all the other litter they found and compared its frequency to balloon trash. Balloon-related litter comprised the largest group—40 percent—while plastic beverage bottles were second at 22 percent, and fishing and aquaculture gear third at 12 percent. To help people in other regions develop their own data and expand the research, the team also developed a protocol, “Balloon Litter Monitoring and Assessment for the Coastal Environment,” which lays out how to systematically conduct a beach survey for balloon trash. Today’s survey on Fisherman Island is a test-run of the protocol, helping educate volunteers on how to conduct their own independent surveys. Having timed the survey for low tide, Trapani first uses a measuring wheel to determine the width of the beach from the water to the dune, then a half-mile—the suggested survey length is a mile, but today we are moving more slowly since the volunteers are learning on the job. It’s also wickedly hot, well into the 90s, with not a cloud in the sky. It’s not your standard beach cleanup. of plastic ribbons, color, and any other attachments. The small army fans out, the Bay Bridge-Tunnel arcing gracefully away behind them, while just the horizon’s edge, the hotels and condos of Lynnhaven and Virginia Beach shimmer in the heat like a submerged city slowly rising from the sea. Slathered in sunblock and shaded with hats and UV shirts, Justin Ellis of Clean Virginia Waterways works with McKay and Nick Meade, the GIS coordinator at the Virginia Coastal Zone Management Program. O’Hara coaches them in balloon forensics. She spreads out a ragged piece of opaque plastic they have dug from the sand and points out evidence of provenance. Ellis sees a bit of string and follows it into the sand, emerging with a deflated but intact foil balloon depicting Minnie Mouse. He poses for the photo. “Does Disney really want Minnie Mouse all over a national refuge beach?” O’Hara muses. Identifying a balloon’s source, if possible, helps the researchers target potential audiences to educate about balloon litter. The August 2018 report notes that companies including Disney, Kaleidoscope, Anagram, Chick- Fil-A, Chuck E. Cheese, and Edible Arrangements use balloons as marketing materials, and they were found on Virginia’s beaches. So were balloons from local real estate companies, dental practices, fundraisers for charities, and weddings. In an innovative first foray into this kind of proactive education, in 2014 CVW and the Virginia Coastal Zone Management Program, supported by a grant from NOAA’s Marine Debris Program, researched and developed a community-based social marketing campaign called Joyful Send-Off, which educates wedding planners, wedding venues, and the bridal business about alternatives to balloons in their celebrations. On joyfulsendoff.org, they can also find local organizations and businesses that have partnered with the campaign and committed to litter-free weddings, among them the Chrysler Museum of Art, Norfolk Waterside Marriott, and the Virginia Museum of Contemporary Arts. The campaign research provided some interesting information, says Register. Using focus groups, phone surveys, and interviews with balloon-release organizers and retailers, the researchers learned that most balloon releases happen at happy or sad events—weddings, graduations, funerals, and memorial services, respectively. Twenty-nine percent of the people surveyed in Virginia said they had attended an event where a balloon release took place, and 20 percent in Maryland. Remarkably, the most common venues for balloon releases were schools, followed by parks, churches, homes, cemeteries, and community centers. Plant a wildlife garden to attract butterflies and birds. Install a bird bath or bench at a park. of them in the trash. Release balloons inside. Then, pop and dispose of them correctly. Give everyone a balloon and a pin and tell them to make a wish for their loved one. On the count of three, everyone bursts their balloons, sending wishes to heaven. Donate books to a library, food to food bank, or pet food to an animal shelter in honor of a loved one. Ribbon wands for the send-off. The campaign provides a template for other audiences who may traditionally turn to balloons for marketing or events, including car dealerships, funeral directors, school administrators, and sports teams. We’ve only made it about a third of a mile down the beach at Fisherman Island National Wildlife Refuge when the team calls it quits in mid-afternoon, after about two-and-a-half hours of surveying. The tide is on the rise and the heat is getting dangerous. We gather sack after sack of trash, filling the bed of a pick-up truck which Trapani will drive to the dump. The final tally arrives via email from O’Hara about a week later. In one-third of a mile, the team found 27 balloons, 57 percent of which were foil; 90 plastic ribbons, 52 of which were still attached to balloons; a foil Minnie Mouse, Mother’s Day, Baby Boy, and two foil happy birthday balloons; and 828 pieces of additional marine debris, including 114 plastic bottles, 42 pieces of fishing gear, 34 plastic bottle caps, and 230 pieces of plastic foam. Update: Since this story appeared in the April issue of Chesapeake Bay Magazine, a study published in the journal Scientific Reports found that balloons were the deadliest type of marine trash for seabirds. Wendy Mitman Clarke is an award-winning writer, author, poet and a CBM editor-at-large. She is the director of media relations at Washington College.